Miyamoto Going back to Mario 64, once when Kotabe-san was looking back at that time, he said he was finally able to do what he had always said he wanted to. Iwata Miyamoto-san told me about that conversation with you. Miyamoto You didn’t say you were happy about what had become possible at that time, but that you could do what you had always said he wanted. That made me really happy. Kotabe At first there were so many restrictions. Miyamoto For so long we could do so little, but you stuck with us. Kotabe Something else from that time made a strong impression on me. Once games became 3-D, they would normally become more realistic, which I thought would involve introducing motion capture. When you rejected that, I was surprised. Kotabe Even though one would normally want to use real elements, you rejected that and proceeded in a different direction. I thought that was really something. Iwata Why didn’t you want to use motion capture? Miyamoto Well, way back when I was first making Popeye, I couldn’t draw well, so I copied everything when making animation, but when you play the game that way, the response wasn’t very good. Even if Popeye appears to move nicely to the eye, you can’t make him move the way you want him to, which I didn’t think was good for the world of video games. Iwata When you press a button you want an immediate response. If there’s a preparatory movement beforehand, it doesn’t feel right. Miyamoto For example, when you press a button, Link immediately pulls out his sword, but then he slowly draws back, and the second time makes a clean swing. So, when I decided to combine both smooth movement and satisfying interactivity, I knew simply importing existing anime technique wouldn’t be enough. Miyamoto That we would give serious thought to that and attempt to achieve it was our strength. For a while that was all I thought about. I wasn’t rejecting realistic movement. I was giving priority to how it felt to play the game rather than to smooth movement. And when showing the movement was an important element, we emphasized on the smooth movements. I recall there were times, when I talked quite fervently about these. Miyamoto But after you became involved with Pokémon, we hardly spent any more time working together. Iwata We started making Pokémon Stadium, (Originally released for the Nintendo 64 in 1998. Linked with software for the Game Boy), and Pokémon Snap, (A first-person action game originally released for the Nintendo 64 in 1999), at the same time. Miyamoto When we started, we knew we would have to create 151 monsters. Iwata All we had was two-dimensional data, so we had to change them to 3-D models one by one. Iwata Yes, I remember that. We would watch the model turn around and fix the places you pointed out, and it would rapidly start looking better. I wondered how it worked. It was outside my area of expertise, so it was like watching magic. Kotabe I couldn’t move the model myself, so I felt like it was a group effort. But I was pressed up against the desk, so I thought maybe I was irritating those I worked with. Iwata No, not at all. Every time you gave some sort of instruction, it was like a ray of understanding broke across everyone. How are you able to work such magic? Kotabe It’s the same as conventional animation, which isn’t really one-sided. You have to make it move, so you imagine the parts you can’t see as you draw. Miyamoto I think Kotabe-san has a camera in his head. What surprised me the most when he first drew a picture for me was that each picture reflected a camera position. Iwata He could draw from different angles. Miyamoto Depending on the picture, the viewpoint might be looking up a little from below or slightly looking down from above. When we turned the Pokémon monsters into 3-D, Kotabe-san must have been able to imagine what they should look like using the camera in his head. Iwata I see. Something else I noticed while watching you work on Pokémon was how good Kotabe-san is at offering praise. My work used to be drawing key animation and checking others’ key frames. Those pictures are infused with the artist’s enthusiasm. That’s why it’s better to direct that enthusiasm toward corrections. I can sense the good in anyone. Kotabe My work used to be drawing key animation and checking others’ key frames. Those pictures are infused with the artist’s enthusiasm. That’s why it’s better to direct that enthusiasm toward corrections. I can sense the good in anyone. Iwata During the course of its long history, Nintendo has been surrounded by all manner of good fortune. You could say that our relationship with Kotabe-san is an example of Nintendo’s immense good fortune. By the way, Kotabe-san, you have published an animation art book called “Collection of Yoichi Kotabe’s Animation Arts”, haven’t you? Kotabe Yes. There’s been talk for some time of bringing out an art book, but I thought it must be a joke. I didn’t even know if much of my original art still existed. But several years ago, when we remodeled our house, I found a wicker basket stuffed full of old art in the back of a closet. I showed the art I pulled out of there to an editor and he found a lot he wanted to put in the book. Even if I resisted because I found some of it embarrassing, he insisted. He even suspected me of keeping some more in hiding! Kotabe We put in so much that there wasn’t’ anything left over afterward! 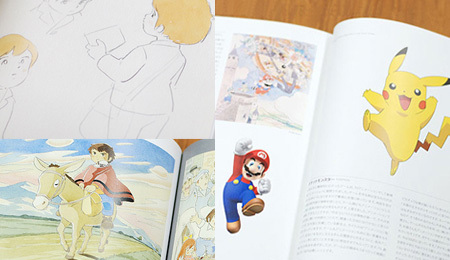 Iwata How many illustrations are in it? Kotabe So many I don’t even know. Some of the art is from animated movement, so we decided to call it an animation art book instead of just an art book. It also has a lot of sketches from character design. It’s mostly those things. Koizumi I hope many people come to know your work through this book.